quite interesting image surfaced on the Web - namely Wikipedia Commons - of an Uhlan (with a lance etc) that is described as a member of the Hanoverian army, a light cavalry unit known as Scheither-Corps (1758). Hanover fought on the side of Prussia and United Kingdom during the Seven Years War. However, the Seven Year War Project known as ''kronoskaf'' has a page devoted to the Scheither-Corps and there is no mention of any Uhlans. light cavalry with the Prussia, armed with pikes/lances, sabre, perhaps pistols or carbine too. In any event this uhlan reflects the fashion of Polish military of the first half of the XVIII century, although the dolman is a novum, for our Polish uhlans would wear a żupan under their kontusz or kurtka. The similar uniforms were worn by the Polish Uhlans in Saxon service ( kronoskaf has two units reconstructed here and here), Gallica has an image of one Polish uhlan from 1736 (he appears to be wearing a kurtka), and there the uniform colours and lance pennon are generally the same (more on these early uhlans in the future) , so perhaps this horseman represents some rouge company that served with the Hanoverians, after having been taken prisoner or switched service under more profitable circumstances? I like the way this artist represented the mount of this light cavalryman - a rather smaller, spirited war horse, and by the way a Luckner Hussar rides a similar horse, while perhaps it worth observing that quite similar mounts would appear in de Warnery's work on cavalry. I should add that this uhlan is most likely a towarzysz (following Polish miltiary tradition and enlistment), or a noble trooper thus armed with lance, as opposed to a pocztowy (retainer/trooper) that was armed with a carbine (cavalry musket) etc. 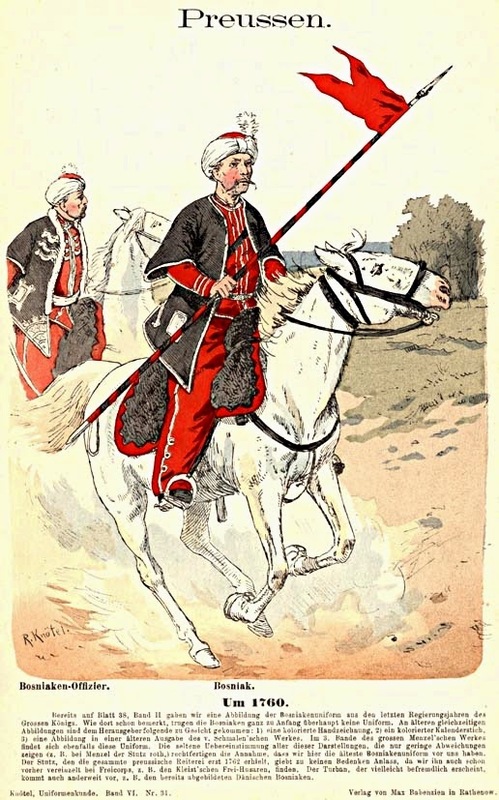 The officers of the 'Saxon'- Polish uhlan regiments wore a bow case hanging from their belts, perhaps a sing of their noble Tatar and equestrian tradition. Finally, I played with this Uhlan a little bit, sketching with an ink pen (enjoying my manga Kuretake pen nibs & Hero manga fountain pen), and in the left corner included a sketch of the szarawary as they appeared in the period art, showing Polish cavalry etc. I did not give him a lance etc, as more sketches will come, I hope.